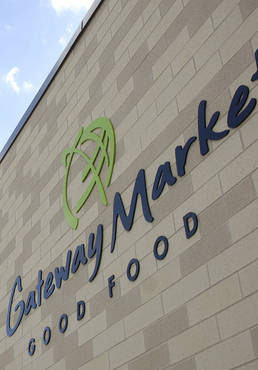 after playing outside, we had an errand to run and ended up at gateway market. we walked around for a bit, sampled some goodies, and stayed for dinner. mr. arganbright had the carne asada quesadilla (very good) and i had the fish corn tacos. my entree was fresh and beautiful but the blackening on the fish was extremely spicy (and i loooove spicy food) so it dominated the other flavors. a little lighter on the seasoning and it would've been perfect. i can, however, highly recommend the chicken fingers! we ordered them for piper and they were deeeeelicious. plus, kids eat free on the weekends! sounds like we're all about the "kids eat free" these days. free is free, but i'll take free gateway over free IHOP anyday! we promised piper a special treat if she was obedient while we ate dinner. she was, so for her special treat, we went to west des moines' free zoo! this little guy was just roaming free when we got there. he was so cute and soft. isn't this the most gorgeous rabbit? i wish you could see it in person. i kind of think rabbits are dumb pets, but this rabbit was beautiful and his coat was sooo soft. i was scared to touch him but mr. arganbright promised me he wouldn't bite. they also had lots of fish in incredible neon colors. i'm not really an animal person, but i think i had as much fun as piper! also, while we were there, a group of employees (all women) were standing around near the puppies. one of them is a labor/delivery nurse. she asked me how far along i was and she told me they were all saying how healthy and pretty i looked! i was so flattered and humbled they would make a point to tell me that. it was such a wonderful compliment from complete strangers! amazing how easily you can improve someone's attitude with a few simple words. i'm going to try to compliment at least one person every day. so watch out, yours may be coming soon! p.s. the nurse also bet that i'd deliver at about 37 weeks. i hope she's right!! !